On the winning side of the equation thus far — Apple(s aapl), Google(s goog), Amazon(s amzn), Qualcomm(s qcom), and Samsung. In the loss column you can include Blackberry(s bbry), Palm(s HP), Microsoft(s msft) and Nokia(s nok). Today, Nokia announced that Microsoft will buy its devices business for shade over $7.15 billion in an attempt to mimic the Apple/Google strategy of owning the hardware, software and services. The reports of this possible merger had emerged as early as June 2013, according to the Wall Street Journal. Stephen Elop’s tenure as the chief executive of Nokia would at best earn him a B-minus grade, and that much because he inherited a company that was spiraling down before he showed up. The “bet the farm on Windows Phone move” however was all him. 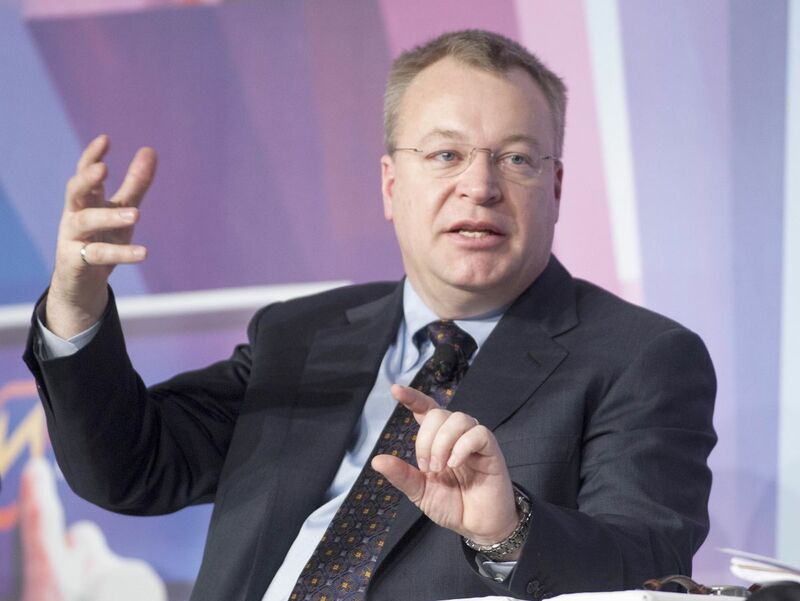 Since taking over the reins at Nokia in 2010, Elop has seen smartphone sales shrink faster than a $5-dollar linen shirt. If anything, Elop’s tenure at the top of Nokia will be remembered for the years when Nokia became irrelevant in the the mobile handset business. In a post, “The End of the (Nokia) Raj”, I hinted at a future of irrelevance for Nokia. The fall from grace came much sooner than even I thought. Elop is now being widely tipped to take over Microsoft as its next chief executive, replacing outgoing Microsoft CEO Steve Ballmer. Given his track record, if I were a Microsoft shareholder, I would have to pause and gulp hard before putting the future of the company in his hands. Microsoft might actually have gotten itself a bargain. It is paying about $5 billion for Nokia’s device business and will pay about $2 billion for licensing Nokia’s patents. In May 2011, there was talk of Microsoft buying Nokia’s mobile device business for $30 billion. The money saved is one thing, but the question that needs to be asked is: what has fundamentally changed with this deal? If you ask me, nothing really has changed. There is a certain quiet desperation in Microsoft’s move. So far, there has been apathy for the Windows Phone operating system — it accounted for about 3.7 percent of the total smartphone shipments during the second quarter of 2013, according to market research firm IDC. There was only really one company that was building Microsoft phones, and that was Nokia. During the second quarter of 2013, Nokia sold a record 7.4 million Lumia smartphones — only after Nokia cut the average selling price by 20 percent. Microsoft and Nokia are two sides of the same coin and now they are both under the same corporate umbrella. Buying Nokia and adding 32,000 new employees adds a further and deeper layer of complexity to a sprawling Microsoft that is trying to figure out who it is, and what it wants to be in the future. It can’t let go of the legacy past — Windows and Office still print money for the company — but its future path is littered with mines. The company essentially fired (though not in as many words) its chief executive officer. Microsoft’s legacy as a PC monopoly holder made it incapable of handling the fast changing, rapidly shifting post-mobile world. And now for the next year Microsoft will be distracted by integrating the two companies — all at a time when Samsung will be releasing a barrage of new phones, Google will be improving on Moto X and Android and, lest anyone forget, Apple will have a trick or two up its sleeve. Oh, by the way, there is that other Seattle-based company: Amazon has been quietly working on its own phones and has plans to take on the current smartphone establishment. And they don’t even care about making a profit — they just want marketshare. There is a widely held belief in the wireless business that there will and should be a third option to Google and Apple. Indeed, for the longest time the arguments were made for Blackberry (LOL!) and then for Microsoft. Some talk about Firefox OS. I ask the question: why can’t the third option actually be Android itself — and what I mean by that is the non-official, non-Google Android. Amazon already has forked Android. Chinese vendors are building their own flavor of Android. Samsung too wants to control its own destiny and build its own flavor of Android. Sure, they all have the same OS foundation, but eventually all these alternative-and-custom flavors of Android can all be the third option. Elop did more damage to Nokia in shorter period than Ballmer did for MSFT so now I understand why they needed to join forces. Om, I totally agree with your observation that this event will benefit the Finnish startup scene. I’ve read the same runes as you but have come up with a completely different translation! I think Apple has made the mistake! People want to be able to use their devices for more than just playing games, watching movies and interacting in social media, and actually the iPad / iPhone falls woefully short of doing that effectively. Indeed the way the 3rd party apps work, their refusal to include decent ports and Apple’s tardiness towards having more than one app working at the same time, have made the iOS look practically Heath Robinson. I can fully understand Apple’s reluctance up until very recently to let Office on their Hardware – knowing that would show up their limitations. My personal journey has taken me from long-term Mac user, to seeing the benefits of Android, to looking at what Microsoft were doing with Tiles to finally seeing Canonical’s vision of device convergence. Apple made many mistakes. Including allowing Google to scarf up their 200 Million users free of charge. By saying no to Google Maps and YouTube with iOS 6, essentially Apple gave Google the green light to make their own App that pumps all that iOS data directly to Google and benefits Apple in no way what so ever. When those apps were baked into the OS Apple had full control over them. Now Google can connect the demographic and both real world and digital psychographics thanks to that very myopic move by Apple. By insisting that users should only focus on 1 thing at a time (aka immersive or whatever) Apple has opened the door for others to come in a take market share away. It may not be all going Microsoft’s way, but it’s clear that in Q3 2013, if you’re going to bring a tablet to the market and claim that it’s suitable for both play and work, then it better be able to do more gymnastics than what Windows tablets can do. They may not be outselling the competition, but they sure have raised the bar, AND lowered the cost of acquiring one. That’s funny. I always thought they were anti-Apple and Microsoft-obsessed. Great article. This has been my reaction to the news this morning as well. The tragic part for me is Nokia. If they had hired almost anyone else but Elop, maybe they would have produced an Android device, and as such, been able to remain in competition. Too bad! I get the feeling that at best this deal will do nothing for Microsoft. At worst, yet another bad move and a large write down. For Nokia and the Finnish? Oh, you poor people! Sorry about this! Great Article, however Nokia shareholders thought it is a great idea! So Om, you wanted Nokia to fork Android as the “third OS”. This of course would mean no Google Apps, no Google Play Store, no Google Now. It would also mean no shared development with Google, always being a version behind. They could not even say they ran Android, as that is a Google trademark. Of course they would be able to run Android apps unmodified, like Blackberry 10 can. That did not work out too well for them, did it. So in short, they would have none of the advantages of running Android, the same deficits they have at present and no multi-billion company ready to bail them out. OM, I dont think you thought this one through at all. MS has lock on 3rd spot whether you like it or not. Forked Android phones will need app compatibility, so they really can’t stray far off Google’s lead. @Om, the third option will really be Firefox OS. The reason is, all mobile platforms switch to HTML 5 standard eventually. Yep, Android has been a mere transfer station for Google to catch up with Apple. By the way, since Google’s approach in licensing Android OS to third parties has proved successful, neither Blackberry nor Microsoft will cut it. Mobile industry is about innovation which thrives in openness. Thus, should MSFT become competitive, their mobile phones must come up with IE OS and perfect HW. mobile is no more likely to switch 100% to HTML5 as a platform than desktop. why? compiled apps run faster and transmit less over the air (no markup). yes, HTML will get faster, but in that same time frame compiled apps will get faster, too (see history). Actually it’s much simpler. Compiled apps = differentiation. HTML5 apps mean a more leveled playing field. OEMs will continue to milk Android while they can. The minute Google tries to squeeze any profit out of it instead of the services it piles on top of it like supplementing its ad business for example, the OEMs will flock to whatever is the next economically feasible option. What a great, well written article! Extremely pessimistic, unwarranted opinion piece. Microsoft is in the midst of a massive reorganization with enough cash to work lots of magic. It is a bold move that needs to be watched carefully, and its potential is huge. I don’t understand the tone, nor do I appreciate it. hilarious! move over to a site where they’ll serve you some nice pro microsoft PR. Speculations and judgements aside, I wholeheartedly agree with the comment that Finnish startup scene will now witness new breed, passion and rigor. Whatever is said about Microsoft’s serious blunders of the past few years it is still a company ‘built to last’ to use the hackneyed phrase. They recognize their missteps which Bill Gates admitted to a few months ago. Purchasing the Nokia devices division at a knockdown price is a smart move – they paid more for Skype. Would not be surprised if Ballmer’s resignation was tied to the Nokia acquisition ie. the board agrees to purchase if Ballmer quits. At a party last weekend, a longtime Android user (in the UK) said their next phone was going to be a Nokia Lumia as that was what others were buying as the next must have phone. I was incredulous but you just never know what young people are going to do and why. As a (relatively) long-time iPhone user, I’m hoping that Apple don’t slack off, particularly with regards to cameras. The iPhone commercial I have seen more often here in Singapore has the line “more photos are taken with the iPhoneâ€¦”. While that is likely true, unless the iPhone 5S becomes actually available here (in Singapore, a technology-lagging Second World company town) much later than the Lumia 1020 does, I’m planning on buying the Lumia to replace my ageing iPhone 4. Some American friends of mine have been sending photos they’ve taken with their 1020s, and they have the same sort of awe and wonder as people did when they got their very first camera phones. The best camera you own is always the one in your pocket. People here do three things with their smartphones: send texts, take photos and get on Facebork. Your phone doesn’t really need to be very “smart” to do any of those, and great (or even decent) photos are the hardest-to-accomplish of the three. Which phone helps the average-to-poor photographer get the best photos? It’s not the Camera app in iOS 6, is it? Please? MSFT just bought the only Windows Phone OS customer. So they are in the device and App Store business. This means $7 billion to be #3 in a business where only the top 2 make money. Android at #2, and Android #3 help get #Android to #1? Your article is so riddled with errors i stopped reading it just to post this comment… They bought Nokia for about $5 billion not 7.2 and don’t know what bubble your living in… Amazon isn’t exactly successful in mobile… The kindle fire is a flop and they barely have a presence outside the USA. The difference refers to a licensing fee paid for Nokia’s tens of thousands of patents. apple’s via its Mac line is the most profitable PC maker in the business. not bad for having “lost” the PC war…i wish my business could “lose” like that. Om, great article. I understand your reasons for declaring this buyout a failure but I really do not think Microsoft has any other realistic alternative. We know from their tablet sales that their mobile strategy is not taking off and I see this buyout as a bet to claw back into the game. In fact it is surprising that they did not do this a while ago when they announced their partnership with Nokia.To me the partnership was a half-hearted effort to get into the mobile wars and the buyout should really have happened then. Well, can the Nokia teams really work with the Microsoft people? It’s a very striking organizational change â€“ first One Microsoft, now One=Microsoft+Nokia? We’ve all seen the famous organizational charts of big tech company cultures â€“ Nokia wasn’t included amongst them, but I still predict the problematic part in this equation is Microsoft. WTH ? people knew this right from feb11 when elop killed symbian and the play then on has been about killing nokia softly. every move by elop was designed for maximum microsoft benefit – closing down “unnecessary” divisions (unnecessary to microsoft). unless you were living under a rock – this was pretty much on course, and well discussed for 2 years since feb’ 11. At least Nokia shareholders will finally get closure, just not the way they hoped. I believe Nokia was being pressured to go Android and this Microsoft could not allow because it would have been the death of Windows Phone. So Stephen Elop steps down from Nokia (or whatever will be left of it) and goes back to Microsoft? Anyone else think that this deal is rather *personalised*…. It’s been “personalised” since “the burning platform” memo and move to WP. Thanx for the great article, good to know. Deal may be risky but will help MS to reach to wider strata of developing economies, Brand-building…. Microsoft don’t really have a strategy as such, other than making sure it â€” whatever “it” happens to be â€” is capable of running Windows. Still, MS did not manage to make its own departments on the same campus work together. And now they will change the CEO, do the largest restructuring in their history, plus integrate another 32.000 highly irritated â€œforeignersâ€â€¦ and this will automatically and magically improve something? I would be astonished. Predictably, yet another Microsoft shill crawls into the commenter crowd when the article is not to flattering of Microsoft, tries to defend and/or put a positive spin on the deal, and automatically attributes being anti-Microsoft as being pro-Apple. Just listen to yourself, Tim Acheson. Microsoft has a pretty poor track record with devices (Zune, tablets, etc). The only thing which has done reasonably well is probably the XBox. And if you go by what it has done and continues to do to Skype, it doesn’t bode well for Windows Phone as an OS either. This is nothing but a last ditch effort to pull out a rabbit from the hat. But what Microsoft needs is some real magic triggered by disruptive innovation and not a magician’s illusion. Steve Jobs is often criticized for his “reality distortion”, but he backed it up with path-breaking devices and technologies. Microsoft has so far not done that with any device. Hoping Nokia will be the messiah is just wishful thinking.